This Cherokee Grey Wolf travel trailer is bright and cheery and ready to party! You can enjoy your view while seated at the booth dinette or the sofa with a hidden bunk above it in the living area. A walk-in pantry is located just inside the entry door so that you can easily stock up on your favorite snacks and dry goods for your adventure. 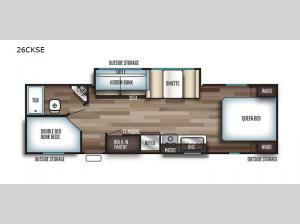 At night, you will find sleeping spaces for ten when you use the sofa, booth dinette, double-size bunks, and front queen bed. Add some privacy in the bunk area, as well as up front, by closing the curtains around you. This will easily section off the front bed area for sleeping and create a private dressing area too.